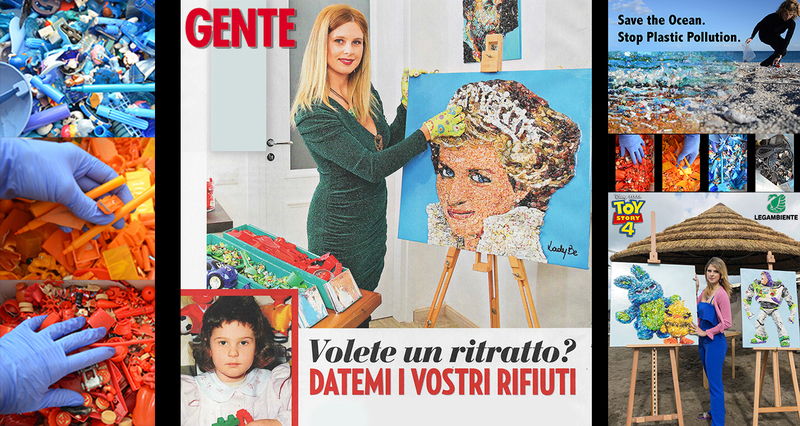 Exhibitions all over the world in Museum, Art Fairs and Galleries..
Lady Be is a Pop Artist inventor of the Contemporary Mosaic a special mosaic made of recycled plastic contemporary objects and toys. Lady Be creates contemporary mosaics, icons and famous portraits entirely composed of objects that have lost their original function, simply becoming "colors". Each work has the power to awake memories connected to each object, when you see it closely, and to be perfectly recognizable from far. Moving away from the painting, in fact, the initial confusion caused by the view of an apparently meaningless assemblage becomes astonishment. The subject takes a form and you feel proud of recognizing the face as a whole. The work has a photographic look, its depth emerges clearly with lights and shadows, as well as the memories connected to the subject. Lady Be cria mosaicos contemporâneos, ícones e retratos famosos, compostos inteiramente de objetos que perderam a sua função original, simplesmente tornando-se “cores”. Cada trabalho tem o poder de despertar memórias ligadas a cada objeto quando observada de perto e perfeitamente reconhecível de longe. Afastando-se da pintura, de fato, a confusão inicial causado pela visão de uma assembléia aparentemente sem sentido, torna-se espantosa. O assunto assume uma forma e reconhece o rosto como um todo. O trabalho tem uma aparência fotográfica, a sua profundidade emerge claramente com luzes e sombras, bem como as memórias ligadas ao sujeito. Lady Be lives and works in Rome. After the Art School and the Academy of Fine Arts, her Contemporary Art starts with artistic use of recycled materials. Since 2010 she exhibited in major art exhibitions in Italy and abroad. In 2013 she staged a curious performance: all the spectators were called to remove the pieces from the installation leaving the subjects completely "naked." In 2014, the turning point came with two major exhibitions: one in New York and the other on the Eiffel Tower. She's present in several art fairs, art magazines, catalogs and numerous newspapers talk about her success. O trabalho de LADY BE está representado em várias feiras de arte, revistas de arte e catálogos internacionais. Lady Be talks about her art not only as creative form, but as awareness to the problem of recycle. It's a warning to the actual and future world, a world where more and more resources miss, and to survive it has to become more sustainable. A world that fights against the tendency to consumerism and waste, the accumulation of "disposable" things increasingly difficult to dispose of. The issue of recycle was a topic discussion for many years, but no one has focused on artistic recycle. Lady Be gives a new life to objects that have lost their original function, elevating them to the altar of Art. Buying a work of Lady Be means acquiring the knowledge that everything can be reused and any object can get an higher value, an economic value. Statistical data show that those who have invested in historicized artists have not seen an increase in their asset. Those who instead have made the right choice by investing in unique pieces by young artists at the beginning of their ascent, drew a large profit within a few years.